Let the competition begin. 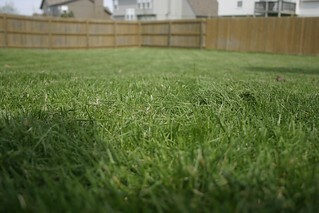 Everyone has started mowing and fertilizing their lawns, but how will your lawn look going into summer and the fall. For me, it is all about having a dark, rich, green lawn. Check out this video. Lots of tips here. I actually perform a number of the tasks listed here. Water a few times a week for a longer period of time to maximize the amount of water that is getting to the roots. Mow with a sharp lawn mower blade. Lightly water fertilizer into the ground right after application. There are many tips from this video. Check it out! Good Luck with your lawn care efforts.